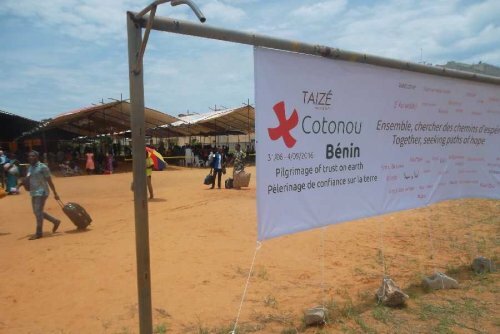 At the beginning of September, the African youth meeting organized by Taizé took place in Cotonou, a new stage in the ["pilgrimage of trust on earth"-art20804]. Here are some testimonies received following the meeting. During the pilgrimage of trust on earth in Cotonou, I can first say that I was struck by the number of participants and the impressive ease of adaptation to the mode of prayer that was discovered. Then the fraternal friendship, the discovery of each other, the sharing of the same ideas, the same feelings, the union of so many people in the same faith and the welcome in the families, which was simply extraordinary. The young people were very satisfied with these moments of faith and joy. They have not ceased to communicate with each other through social networks, sharing photos, feelings, jokes, projects until today. Taizé-Cotonou was a great moment for our young people. Initiatives in the direction of living together and inter-religious brotherhood are being taken by young Christians and Muslims. And we try and will go on trying to accompany these young people to the extent of our possibilities, counting on the grace of God. The meeting in Cotonou taught me to place God at the heart of my existence and to rely on him. It is a capital thing learned during my stay in Cotonou and today more than ever it inhabits me every day. I have also learned gratuity, self-giving and humility in my work, that is, this way of surrendering oneself completely to the Lord. I think that without this abandonment we could have done nothing in Cotonou. Today, it is part of the evangelical values that I received during the pilgrimage. Having come in large numbers from every part of Africa and even from some countries in Europe, these young people, some very confused, have been renewed and left very well equipped to live their faith in an environment which is increasingly hostile to their development. Indeed, Africa remains globally marked by a tense sociopolitical and economic situation, an inflation of the spiritual and new cultures with fuzzy contours. With Taizé 2016 in Cotonou, trust is reborn; the young people have rediscovered Christ, life is no longer an absurdity but in him it has a meaning. They have become aware of belonging to one family in Christ. So they have woven new forms of brotherhood, exhorted as they were to solidarity and a commitment to be witnesses of Christ. The team from Togo returned home safely and has stayed in close contact. Most recently one of us lost his little brother and the group in Lomé mobilized spontaneously beside him; another, having been hospitalized just after our return from Cotonou, saw the young people beside him through messages of support and visits. My host family in Cotonou was in Lomé, just one week after the Cotonou meeting. It was with great pleasure that my husband and I welcomed them in our turn and arranged for them to stay with our wedding godparents where they spent three days of good fraternal moments with their three children. The path of hope certainly continues, for each pilgrim, to a certain extent. Links have been forged, families have been created, in order to see h together ow to pool energies and reflections for peace and development in our communities. The meeting with many witnesses of hope during this pilgrimage, the cohabitation with young people from other countries, Christian denominations and different cultures, the rush each evening to board the coaches, the animation in the coaches during the journey, and the constant joy: these are experiences that have increased my trust in God who continues to act in us and in the world, my trust also in my fellow-human beings and in our world. It is with fresh eyes, eyes full of hope and gratitude that I returned from Taizé in Cotonou to the Ivory Coast. All the Nigerian delegates have returned safely to their country. Thank you for the opportunity for our youth and chaplains to experience the pilgrimage of trust. In the pilgrimage, what I most appreciated was the simplicity of everything: the contents, the place, the people praying, the food ... In the midst of the materialism in our country and in the world, where many people are still hungry, we have much to learn about simplicity of life and happiness. As I said on the evening of the meeting, I was particularly touched by the community life. I had very often in mind the Body expressed by Paul in his first letter to the Corinthians, chapter 12. Although I grew up in a family where community life is a pillar, having been a volunteer in Taizé, I learned a lot in this area during those few months. It was really beautiful to see the construction of the body, of the balance between the limbs that we each were. There was something very right in our life together and the work of preparation: each one remained attentive to the needs of each one, relying on the resources of the others and allowing herself to be helped in her weaknesses. 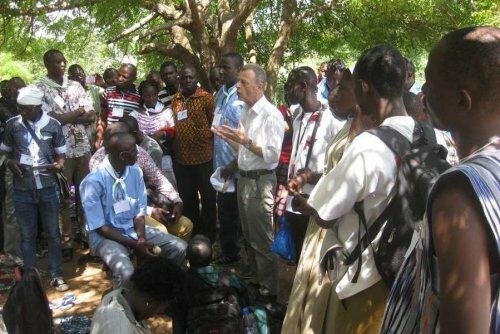 What I remain firmly convinced of is that young Europeans and young Africans must meet. This seems to me to be crucial because I have learned an enormous amount from their culture, their joie de vivre, their capacity to welcome, and the young people of Africa have to become aware of what we really are. (...) And then of course, those few months on the soil of Africa, the discussions that we exchanged ... have only increased in me the desire to know even more about this continent, about their wealth, their poverty ... and therefore an immense desire to go back! A film about the Cotonou meeting has been put together by Father Benoît Luquiau, diocesan youth chaplain for Parakou. It can be viewed on line in French and in English. A young participant from Russia, Tanya, has also put online a short video with some images shot in Cotonou. 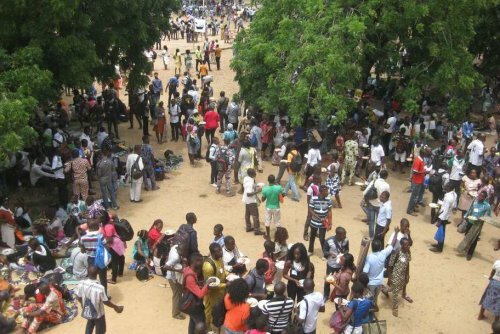 On another page of our site you will find various press reports about the meeting from the media in Benin and elsewhere.